If upgrading your pc is out of the question, you still have plenty of options for increasing its pep. Here are some suggestions that are worth a try. Depending on your system, changing a few simple software settings can lead to massive performance gains. Run a virus scan: Your PC probably doesn't have a virus, but why not make sure? Schedule your antivirus program to run a weekly scan during late night hours so it won't interfere with your day-to-day computer activities. Upgrade your power settings: By default, Windows sets computers with batteries (that is, laptops) to the ‘Balanced' power plan profile. That setting strikes a nice compromise between performance and battery life; but if you leave your computer plugged in all the time, battery life is irrelevant. You can enhance your laptop's performance by using a higher-end power plan, which Windows hides by default. To access it, click the battery icon in the system tray and select More power options. Select the drop-down next to Show additional plans and choose High performance. Among other things, it will turn off options that put your computer to sleep, saving you significant restarting time when you step away from your PC. 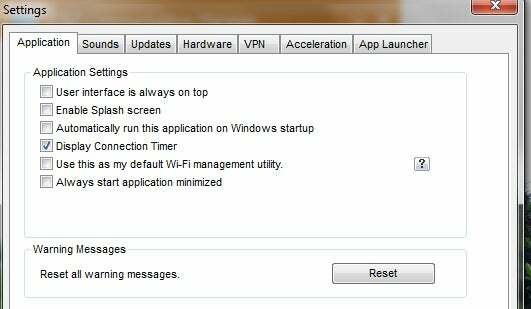 To reduce system clutter, regularly prune installed apps in the ‘Programs and Features’ control panel. Uninstall, uninstall, uninstall: There is no shame in having installed lots of software on your PC. After all, Windows was designed to run thousands upon thousands of applications on a familiar platform. The problem is that every application occupies space on your hard drive, and many take it upon themselves to open at startup, clogging system RAM whenever your PC is on, whether you use the program or not. Visit the ‘Programs and Features' control panel, and uninstall any application listed there that you're sure you don't use. Not using an iPod anymore? Apple alone accounted for six applications on our test PC. Watch for toolbars and device drivers for products (such as printers, WWAN modems, cameras, keyboards, and mice) that you no longer use. Click Uninstall to remove each one. You'll likely have to reboot multiple times. Clean up your hard drive: Having a lot of stuff on your hard disk isn't a problem until the disk gets full and Windows has to work overtime to find spare bits here and there to store your files on. 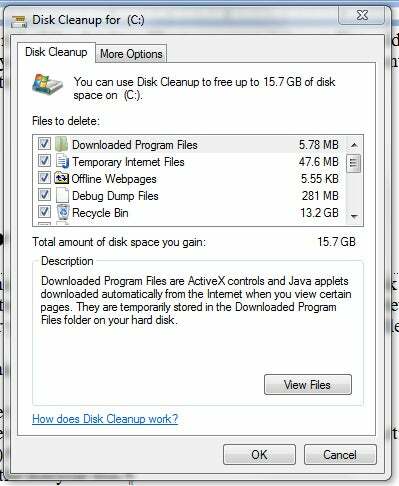 Windows’ built-in Disk Cleanup utility shows you how much hard-drive space your PC is wasting and identifies the main culprits. Offload whatever you can to external hard drives or other archival storage; then run Disk Cleanup to get rid of junk such as temporary Internet files, old installation programs, and Recycle Bin junk. To access Disk Cleanup, type disk cleanup in the Start menu search box, and press Enter. Select the boxes for each type of file you'd like to get rid of, and let Disk Cleanup do its magic. Give ReadyBoost a try: If you have an older PC with very little RAM, you can cheat your way to a modest speed increase by using ReadyBoost, which lets you plug a USB thumb drive into your computer and use it in lieu of true RAM modules. To use this strategy you'll need a high-speed USB port and a large, high-speed USB drive. If the drive is a good fit for ReadyBoost, Windows will give you the option to enable it when you plug it in. When the AutoPlay window pops up, select Speed up my system; then follow the instructions. Try new drivers: According to conventional wisdom, you shouldn't install new drivers if nothing is wrong with your computer, because doing so may mess up something that worked fine before. Admittedly this undesirable result can occur, but you are far more likely to im­­prove your PC's performance. To minimize your risk of breaking your PC with a bum driver update, first create a System Restore point that you can go back to if anything goes wrong: Type Create a restore point at the Start menu search box, and click Create... in the window that opens. This will create a safety net that you'll have access to, no matter what happens. Your next stop in upgrading the drivers should be Windows Update. Click Check for Updates, and then click the text noting how many updates are available. Typically Microsoft classifies driver updates as optional, so even if the Windows Update text indicates that you don't need any critical updates, you should still click the link. Tick the checkbox next to any updated drivers, and click OK to install. Next, visit the manufacturer's Website for your computer and/or for the devices you have attached to it. Check the support page for your machine, and download any new drivers that appear. In most cases you'll have to know the particular piece of hardware that is in­­stalled on your machine (check the Windows Device Manager if you're not sure what a component's model number is), and you should download only the drivers you need. Install the new drivers as instructed; usually this step in­­volves running a simple executable file and then rebooting. Test your system thoroughly after each driver installation, and make additional System Restore points if you're upgrading more than a few drivers. The largest performance gains result from updating your BIOS, motherboard drivers, and graphics card drivers. To drop splash screens from your PC, go to Application Settings and uncheck the box next to 'Enable Splash screen'. Kill splash screens: Splash screens don't bog down your computer per se, but they do insert a speed bump into your schedule whenever you launch an application, and that extra time can add up. You can turn off many splash screens in the programs' settings. Turning off splash screens may not make your application load significantly faster, but it may make it feel that way to you. Scrub startup apps: In all likelihood, an astonishing number of applications in your PC load junk at system startup without your knowledge. Let's cut 'em down. First, take a look at what's in your startup queue by typing msconfig in the Start menu search box. Click the Startup tab, and you'll find a list of everything that loads during boot time, probably including a number of programs (notorious examples include QuickTime and anything Adobe makes) that clog it up. Uncheck the box next to each application that you don't want your PC to load during boot. The free Soluto app speeds startups by delaying the loading of nonessential programs. Another option is Soluto, a free tool that performs the same operation on a crowd-source basis. If you're unsure what some of the applications in the msconfig display are, Soluto can probably tell you-along with exactly how much time each one costs you during startup. The catch: Soluto itself will slow you down by a few seconds, so install it only if you know your system has a lot of stuff loading at startup that you can safely get rid of. Turn off search indexing: The ability to search your computer at Google-like speeds is one of Windows 7's (and Vista's) greatest strengths. But if you're organized, you may not need to use it--and no matter how orderly you keep your business, indexing services will slow you down, sometimes heavily. To change indexing settings, type services at the Start menu prompt, and run the Services application. Scroll down to and right-click Windows Search, and then choose Properties. There, change the ‘Startup type' to Disabled, and finish by clicking OK. In the Personalization control panel, you can turn down system visual effects by switching to a basic and high-contrast theme. Clip Aero's wings: Windows' desktop display with translucent windows, variable backgrounds, and other trappings certainly looks pretty. But those effects can slow your system considerably. To turn them off, open the Personalization control panel, and scroll down in the main window to ‘Basic and High Contrast Themes'. The Windows 7 Basic theme is attractive but uses much less graphics-rendering power. If you want to make more-granular tweaks, open the ‘Performance Information and Tools' control panel and click Adjust visual effects in the left-hand pane. Here you'll find two dozen specific settings that you can adjust for better computer speed; turn them off by clicking the Adjust for best performance button and then clicking OK. 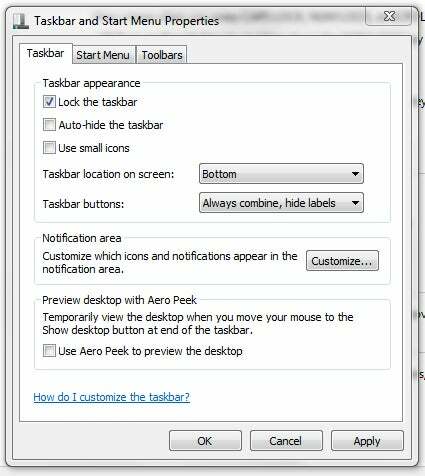 Turn off Aero Peek by unchecking the box next to 'Use Aero Peek to preview the desktop'. Delete the Peek: Aero Peek and Aero Snap each consume a relatively small amount of system resources, but disabling Aero Snap will likely save you time by eliminating accidental snaps that you have to undo manually. To access these features, type ease at the Start menu prompt and select Ease of Access Center. At the bottom of the screen, click Make it easier to focus on tasks. Put a check in the box that reads Prevent windows from being automatically arranged when moved to the edge of the screen to turn off Aero Snap. While you're in there, consider checking the box di­­rectly above the Turn off all unnecessary animations (when possible) option, as another minor timesaver. To turn off Aero Peek, right-click the taskbar and select Properties. Then un­­check Use Aero Peek to preview the desktop. Kill compression: If your hard drive is suitably large, you have no reason to compress folders on it that you regularly use. Decompressing files on the fly only slows your access to them. To uncompress a compressed folder (without third-party compression software installed), right-click the folder and choose Extract All. Follow the prompts to choose a destination for the uncompressed files; then delete the original, compressed folder. Go thumbnail-free: If you've ever tried to view thumbnail images in a folder that holds several hundred images, you have probably seen Windows choke at the task. To disable the thumbnailing option, open Windows Explorer and click Tools, Folder Options. Click the View tab and check the box for the first option: Always show icons, never thumbnails. Worth a try are the free CCleaner, PC Tools' Registry Mechanic ($30/year), and Iolo Technologies' System Mechanic ($40), but positive results are not guaranteed.